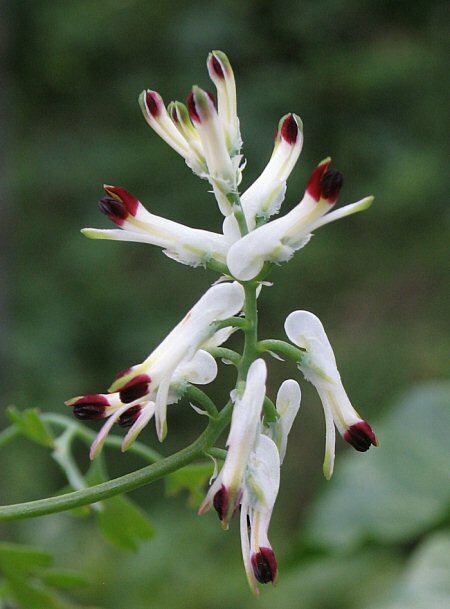 ﻿ Fumaria capreolata (White Ramping Fumitory) : MaltaWildPlants.com - the online Flora of the Maltese Islands. Raceme up to 25(-35)flowered, shorter than peduncle. Fruiting pedicels usually rigidly arcuate-recurved. Sepals more or less dentate. Corolla 10-14 mm, creamy-white or pinkish, rarely deep red; wings of upper petal and apex of inner petals blackish-red; lower petal with very narrow, erect margin. Fruit usually smooth, obscurely keeled. S., W. & S.C. Europe.